The newest addition to our DIY caravan repair product range is the Eternabond, EternaCaulk, which can be used in conjunction with our Eternabond Microsealant Tapes. You can ensure a double level of protection from water leaks in your caravan or RV. EternaCaulk is a high-performance, multipurpose, thermoplastic elastomer based sealant. It can be applied to dry or wet surfaces. EternaCaulk provides excellent adhesion to most roof surfaces, including metal, Kynar coated metal, asphalt, shingles, modified bitumen, EPDM, TPO, Elvaloy/PVC, hypalon, vinyl, fiber cement, wood, concrete, tile, masonry, and glass. 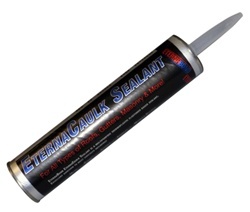 EternaCaulk tubes are suitable for use with standard 48mm caulking guns. Click here to download the EternaCaulk brochure.